I wasn’t expecting to find any Zumba at all in Bali and had resigned myself to a couple weeks of yoga as my physical activity. Don’t get me wrong – I always feel great after doing yoga and I know how good it is for me, but I just don’t enjoy like I do dancing. I’m not terribly flexible and even when I was doing yoga more regularly (back in my bellydancing days), I never felt like I got any better at it. Our first hotel was in Seminyak and offered 90 minute classes twice a day for the reasonable price of 50,000 rph (approx $4). It was a lovely studio with huge windows, beautiful dark wood floors, and lots of new yoga mats and blocks. My first class was Vinyasa Flow with Nita. She was very friendly and did a great job guiding 4 of us through the poses, speaking alternately in English and Indonesian. Because it was a small class, we got a lot of personal attention/helpful adjustments. I was thoroughly fatigued by the end and sore for the following days. This gym did offer Zumba once or twice a week with drop-in pricing, but not on the days I was in Seminyak so I didn’t get to try them out. Their website schedule wasn’t current, so best to contact them in advance if you’re hoping to attend one. Ani teaches at Ubud Fitness three times a week. The drop-in rate was around $5 USD, and the gym was really responsive when I messaged them on Facebook to check the schedule. The studio was open air, so even though there was a nice breeze and plenty of fans, I was definitely extra-sweaty by the end of class. It also meant we had the occassional chicken checking out our moves. Ani is a tiny little firecracker with boundless energy. Her class was great all around – her cueing was fantastic, the routines were easy to follow, and she was always helping adjust where people stood, since the room could get quite full. She offered Zumba Toning once a week, where you use the maraca-like weights for part of the class. They felt light initially but after several songs you could definitely tell they were working! She provides the weights so you just need to show up and shake them! This group knows how to have fun! 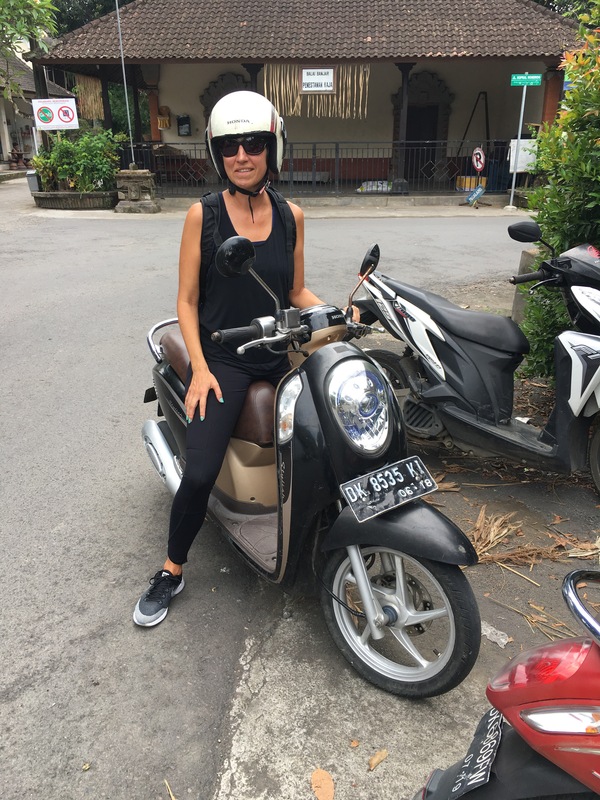 She has a very active community on Facebook and everyone in the class was so welcoming – I really enjoyed it and highly recommend it if you’re in Ubud! There was an underutilized, gorgeous yoga deck at the place where we were staying, Roam, so I decided to offer a (free) Zumba class for any interested residents. 7 brave folks showed up for the first class (including 2 guys!). The humidity was oppressive – I was amazed that 4 people stuck through to the sweaty, sweaty end. So many of them had seen me working out on my own (with headphones) so it was fun to crank up the stereo and have a proper class. When we returned for our second stay, several folks wanted to do it again. Zumba is always more fun with friends, so I held a few more classes. I was impressed with how willing the guys were to go for it! One of our roomies took this timelapse of the last few songs – look at them work it! When I wasn’t teaching a class or going to Ani’s, I would use the yoga deck to work on new choreography or just rock out on my own. It was amazing to have so much space to use, plus I could jump right in the refreshing pool afterwards! The studio was on the top floor of what seemed like a half-abandoned building (the ground floor was occupied by a pretty shabby-looking gym). The dance floor was lovely, though, with pristine floors, lots of mirrors, and a nice stereo. I was the only person in the class that day. While it was amazing to get a private lesson, it also meant there was no disguising my cluelessness. We literally spent the first 40 minutes just trying to get my body into the default standing position, which required more flexibility in my hamstrings than I had. I did do better at the basic walk, so we managed to do the tiniest little combo before the time was up. The instructor was very good and a lovely dancer – though her English was great, she also wasn’t shy about giving me hands-on adjustments. She told me she had been studying this dance since she was very little, including spending an hour a day with her arms wrapped over a pole to try and open her chest and improve her carriage. Suffice to say, I have new respect for how challenging this dance is! All in all, it was very easy to find classes in Ubud, which seems especially set up to handle travellers. Whether you want to do acro-yoga, ecstatic dance, Zumba, salsa or just meditate, there are plenty of classes available! In an otherwise peaceful and friendly place, this has been a frustration… It seemed like I was constantly offered rides when I didn’t need them, but couldn’t find anyone when I did. I finally decided to rent my own scooter, as many of our other roomies did. I spent the first day driving around with my turn signal on the entire time, but otherwise made it to the grocery store and back without incident. At this point in our travels, driving/walking on the left feels more natural, so the “driving” part was pretty easy, but traffic certainly took some getting used to… there were heaps of scooters on the road but no traffic signals or stop signs. Essentially, you just “go with the flow” (like a school of fish) and hug the left as much as possible. (People are often driving down the middle of the road to avoid parked cars.) I mainly wanted the scooter so I could get to a 9am Zumba class across town, which meant dealing with a lot more traffic than I would like but I managed to handle it several times without incident. One day I decided to take the bike on a longer drive, out to a jewelry workshop about 3.5 miles/25 minutes away. I was feeling more comfortable, and figured I could just take it slow and pull over regularly when I needed to check directions. It started off well… there were far fewer people on the road than in central Ubud and the countryside was lovely. However, just a few minutes away from my destination, I lost control around a sharp corner as someone was passing me and slammed into a wall, landing in a ditch with the scooter on top of me. There was so much blood that I immediately knew I was about to violate our cardinal rule of the trip: no hospital visits. I texted the single word “help” to The German as several locals came rushing to my aid. They pulled me and the moped out of the ditch and got me a bunch of kleenex to try and stop the bleeding. At one point, one of them removed my prescription sunglasses from my face – the frames were intact but both lenses were missing. After a lot of frantic discussion, they moved the moped into a nearby driveway and then threw me in a car to rush me to a local clinic. 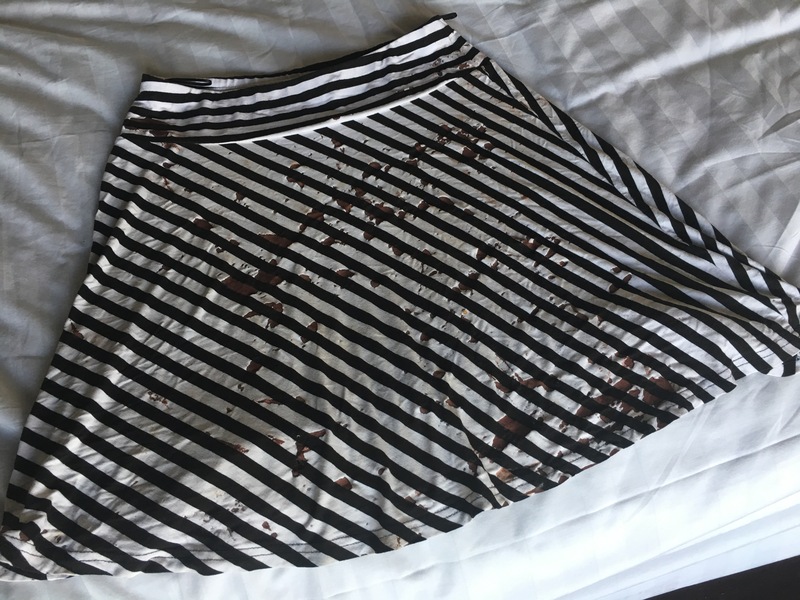 The splatter paint wasn’t part of the original design of this skirt. Neither my rescuers or the nurse spoke English, but I could tell from their conversation and gestures that it was bad. She went to work cleaning me up and kept saying “hospital” while the guys tried to help in any way they could. They kept trying get me to call someone, so they were relieved when I showed them that The German was making his way towards me on Find My Friends. Just as the nurse was applying the last bandage, The German arrived. He quickly paid the bill ($3) and got directions to the nearest hospital. He tried offering money to the guys who rescued me but they refused to accept it. I was so incredibly grateful for their help. We rushed to the Ubud hospital as I struggled to stay conscious. I was wearing a helmet when I crashed, but my head was bleeding from somewhere and the site of the deep gash in my knee was making me woozy. 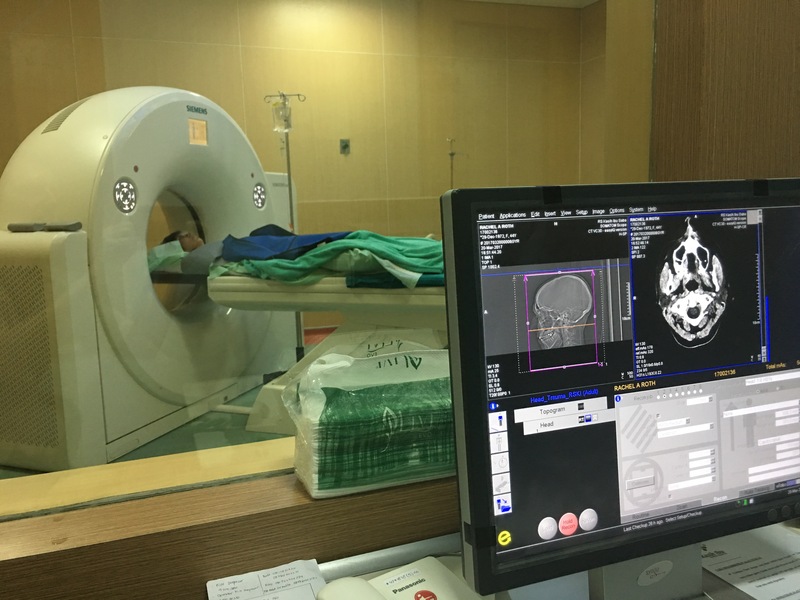 At the hospital, they started to work on a more thorough cleaning but they soon discovered their x-ray was in an error state and would take an hour to fix. (Huh?) They recommended we switch to a different hospital rather than wait. The environment there was pretty chaotic – a screaming child, wailing adults, and the 7 beds were all full so The German ran into the street to negotiate another taxi. Moving was a challenge and the adrenaline was starting to wear off so I was becoming painfully aware of just how banged up I was. It was an agonizing 15 min drive, but definitely worth it – Kasah Ibu Hospital had been constructed in the last year and had very modern equipment, plus I was the only patient in the ER. Check out my big brain! They administered antibiotics and gave me a tetanus booster (eve though I already had one in the past few years) since the wounds were so dirty. Both my knee and elbow were so deeply cut that the bone was exposed. I was going to need a surgeon. The x-rays showed I had a fractured rib and a small fracture in my elbow, but my knee wasn’t broken and surprisingly, neither was my nose. I had quite a lot of road rash on my legs and a cut on my forehead, but the scans didn’t show any internal bleeding so they started surgery prep at 9pm. I was anxious, but everyone seemed very competent and the facilities were modern and clean. I woke up around 2am with The German by my side, who had been answering my same 4 questions in a loop as I was regaining consciousness. Around 3am I was transferred to a room. We got a complimentary upgrade to an “Executive” room, which wasn’t nearly as nice as some hotel upgrades we have received, but it had a second bed for The German, so that’s all that mattered. All of the staff did their best to communicate in English (though it was a challenge at times). They always made sure I was comfortable, though, and modestly covered when there were male workers around. They apologized each time before touching me (“sorry”) which was very sweet and we loved how they always referred to each other as “friends”: “my friend will bring you pain killer” or “my friend would like to change the sheets”. The surgeon wanted me to stay at least one more night so I could continue with the IV cocktail of fluids, pain killers and antibiotics. Moving was painful so I couldn’t really argue with the logic of staying in the mechanical hospital bed. 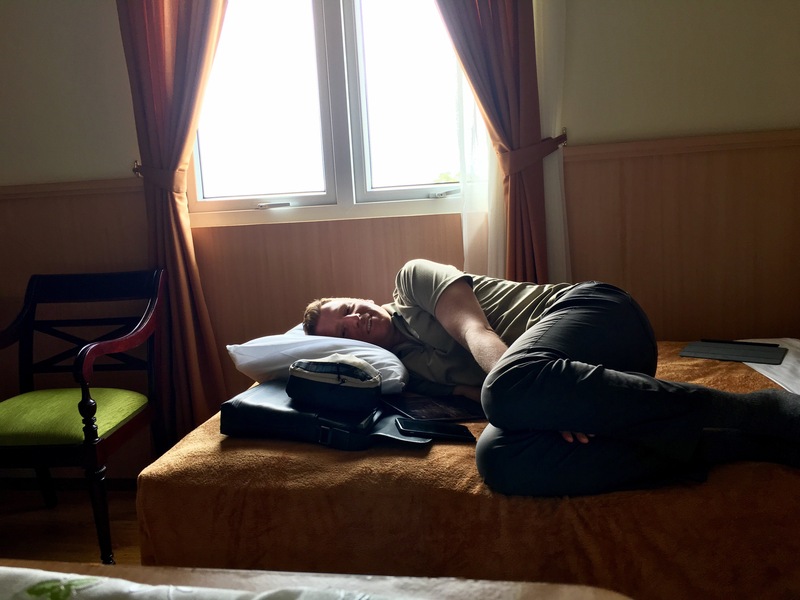 The German spent the long, boring day adjusting my pillows, talking to insurance people, and keeping our local pals updated. The food at the hospital was some of the worst I have had on this whole trip so he would periodically run out for coconut water and other treats. He also managed to get the guy who rented me the scooter to go collect it. (It was 20 minutes outside of Ubud in a random driveway, so no easy task… The German assured him I wouldn’t be needing it again.) I couldn’t imagine dealing with all of this without him – he has been an amazing caretaker. They switched me to oral pain killers, re-dressed all of my wounds, and we collectively decided I should stay one more night. Between the wounds on my knees and right elbow, the broken rib, the IV in my left arm and arm soreness from the Zumba Toning class I did Monday morning, it was hard to transition between sitting and standing and I needed to be more mobile before I could go. The German arranged for Dr. Dyah to pay us another visit. Her English was by far the best and she was able to answer all of my questions about after care. Aside from all of her helpful medical tips, she also told us we encountered the largest earthquake in a decade and apparently people ran into the streets screaming…. what an exciting couple of days! The next morning I was determined to leave the hospital. Moving was still a challenge and laughing really hurt but I desperately wanted the IV out of my arm and access to better food. After a final inspection from the surgeon, they changed all my bandages to “waterproof” and started the discharge process! That works out to be less than $5,000 (USD), which is certainly a fraction of what that would have cost in the US. I am now happily back at Roam, recovering in our room with easy access to fresh smoothies, lots of friendly faces, and plenty of pain killers. Though I am technically cleared to fly, I am still struggling to get in and out of bed and walking around at the pace of a zombie so I can’t fathom dealing with an airport right now. We will certainly stay put for a few more days while I recover. Bali was just so comfortable and easy that after Borneo we decided to return to Roam (the coliving space), for another couple weeks of new friends, great vegetarian food, cheap massage and lots of Zumba. Thanks to my scooter mishap, this turned into a lot more hospital time and a lot less Zumba than I originally planned, but it was still a good spot to recover and meet some more interesting people. Throughout Bali, the housekeeping staff we have encountered have all been men. There were plenty of women in other roles – cooking, working reception – but men handled cleaning the rooms, washing the dishes, etc. (I have been told women also hold these jobs, but we stayed at 3 different hotels and never saw any.) I also noticed a number of local women working as house painters and lugging bricks to construction sites. I enjoyed the contrast to what I normally encountered in the US. Most sidewalks and driveways had ornate designs. Decorative pavement costs the same as the plain, so most people opt for the ornate. It made even a short walk more lovely. One of the main reasons we wanted to stay at Roam was the chance to meet so many different people. Just like last time, there was great diversity in age, background, passions, and country of origin. I was particularly excited to discuss politics with someone from Russia, and hear more about life in Saudi Arabia. Because of our unplanned extension, we managed to be in Bali for the new year celebrations which are designed to restore harmony between nature, man and the spirits. This is the biggest holiday on the island and spans for 6 days, inlcuding 24 hours of silence (for the whole island, enforced by the community police). Prior to the day of silence, everyone on the island prepared to scare off all of the evil spirits. They constructed these large, intentionally ugly Ogoh Ogoh sculptures. Communities come together to create them for weeks ahead of time, and you could tell they took great pride in their creations. Once it grew dark, we headed to the starting route of the parade (which was thankfully only a 15 minute walk, given that I wasn’t terribly mobile). All the Ogoh Ogoh were lined up, with the local children excitedly waiting to carry them. Adults were watching the perimieter to keep spectactors safe as they sent fireworks into the air, annoucing the start of the procession. As the gongs picked up pace, the children worked together to lift these huge paper mache scultpures and start the parade. At various intersections they would shake or turn the Ogoh Ogoh, sometimes backing them down another street just to trick the evil spirits. Some of the sculptures were so large that people had to use sticks to lift the power lines so the monsters could pass. Note the long pole temporarily lifting the power lines. The procession takes a meandering route through town accompanied by lots of noise and fireworks before the sculptures are all set on fire, eradicating any evil influences on life. Though I wasn’t mobile enough to go the whole route, we continued to hear the sounds of fireworks for hours. As foreigners, we were not required to participate but we were also not permitted to disturb our neighbours. This meant we could use electricity (and wifi), but needed to make sure the curtains were closed in our rooms at night so we wouldn’t cast light onto the surrounding houses. We were allowed to cook our own food, but obviously all cafes were closed. And while we did talk, it was certainly quieter than usual, despite having all residents together for the day. It was a gorgeous, clear day and the town was blissfully peaceful – chickens and dogs were the dominant noisemakers. At night, the sky seemed like it was overflowing with stars since the town was so dark. It was a really nice break from all the noise and hustle of the normal days – I think it would be a great addition to all cultures, but it would really only work if everyone participated. It’s been 10 days since the scooter wreck and I am a lot more mobile. I’m still moving slowly as the cut on my knee and the road rash on my ankle are still healing, but all the stitches have been removed and I am thrilled that I no longer have a bandage on my face. Given that the cherry blossoms have started to bloom, we are going to head directly to Japan now. I am expecting it will be quite a shock to go from the small, lush town of Ubud to the modern metropolis of Tokyo, but I am excited to try and improve my Japanese, get a haircut, and hopefully get to enjoy the peak blooms of the sakura! My friends Rick & Randy travel a lot and they have invited me to join them on numerous occasions – from live aboard dive boats to snowmobiling in Iceland. Timing never seemed to work out, so I was super-excited to rendezvous with them in Bali. Given my unemployed status, they agreed to slum it at one of the more reasonably priced (but still 5 star) hotels in the area. I somehow convinced The German we could afford to splurge a bit and immediately made a non-cancellable reservation (at a very discounted rate). The Viceroy did not disappoint. We were welcomed with flower necklaces and mojitos while overlooking the beautiful property. Each villa was positioned overlooking the hillside, so it felt like you had the entire resort to yourself. We used the plunge pool daily, just because we could. Service was impeccable, the property was gorgeous, and even the food was amazing. It’s impossible to have a bad day when you start it with an amazing 3 course breakfast overlooking the lush landscape! tasted lewak coffee, took an early morning bike ride through the rice paddies, and went white water rafting! Somewhere in there, we also managed to have several great meals and found time to sleep. One of the highlights was visiting the Sacred Monkey Forest. This beautiful park on the edge of town is home to 115 different species of trees, 3 temples, and about 600 long-tailed macaque, who roam freely throughout the park (and beyond). The park is owned by the local village and everyone is thrilled to have the monkeys around, despite their sometimes naughty behaviour. Not only does this tourist attraction create many jobs, but the community uses the profits to fund religious ceremonies and temple festivals. It is also a way to encourage balance between people, nature, and spirits – a key value in Hinduism. This little fellow was disappointed that Rick had neither bananas nor mites in his hair. In hindsight, wearing a dress with a flower print was a terrible decision. There were 7 of us staying at the hotel as Rick & Randy had an entourage headed on a diving trip after Ubud. Our social group was quite a contrast to the other guests, who were primarily honeymooners seeking privacy. Each room was a little different, so Randy had the great idea of a roving room party. It took quite a bit of explaining before the staff understood the request to bring the bottles of champagne to different rooms every 30 minutes, but it in the end, it worked out perfectly! We had a great time seeing the different room layouts and swimming in each others’ pools, all while sipping champagne! It was incredibly fun to spend a few days in such a luxe setting with old friends (and make a few new ones). We definitely made the most of our time together, filled with a lot of laughter and great conversation. The guys all headed to Komodo for dragons and diving while The German and I went to Kuala Lumpur for a few nights. Next up for us will be the jungles of Borneo to see orangutans, sun bears, bats and proboscis monkeys! Even though 18 hours of thunderstorms commenced the moment we arrived, we were still delighted with the first impressions of our home for the next two weeks, Roam. We had to apply in order to secure a room at this “coliving and coworking refuge” where they curate a community of digital nomads for their 25 rooms. Everyone gets a spot on the shelves and in the fridge to store their food, plus they provide a lot of the basics like eggs, etc. Cafe and coworking space, with great coffee and also cocktails! I promise she’s alive – it’s just very hot during the day. They organize events several times a week, and have negotiated discounts for residents at a lot of local cafes. It has all the social aspects of a hostel, but with nicer facilities and a much more diverse age range. Most people stay for a week or more. Like in many homes, the kitchen turned out to be the social hub. As we were cooking and eating, we exchanged recommendations for Ubud, discussed various work projects, or just learned more about each others’ journeys. It was a diverse community in age, gender, and country of origin and really interesting to hear what attracted people to Roam. Some of the other residents included: a recruiter, romance authors (2 of them! ), an international tax attorney, a boutique owner, a woman who started her own line of pajamas (during her stay here! ), a fitness instructor, a photographer, a digital storyteller, an entrepreneur and several developers; hailing from America, Australia, Canada, France, Russia and the UK. By creating a space with such a specific intention of community, they have broken down the usual barriers to social interactions. It was very easy to strike up a conversation with others, and just as easy to excuse yourself if you had something else to do. A favourite group outing was to the weekly farmer’s market a few doors away. Just before 9am each Tuesday, an organic farmer parked his truck next door and unloaded the harvest. At exactly 9am, the frenzy of grabbing commenced. It was a great way to get produce, and as much fun to watch as it was to buy. Ubud is in the interior part of the island. Though it is only 15 miles from Seminyak, it takes over an hour to get there by car because the roads are small and meandering. While I don’t have any specific horror stories, I do feel like this is one of the buggiest places we have been (so far)… there was everything from giant dragonflies to huge wasps to beautiful butterflies and ants of all sizes. I quickly learned to always keep any bags zipped up, or risk uninvited guests. (This applies to indoors as well as outdoors.) I will be surprised if I don’t find tiny ants inside my computer after we have left. One of the nicer insects we encountered. It seemed like there were even more temples and shrines here – it made walking to the grocery store more like a sightseeing trip. There are so many vegetarian restaurants in Ubud that it was rarer to find a place that served meat. It was a hippie’s dream – you could get a smoothie bowl and a coconut milk latte at the same place where you bought essential oils and got some”vibrational energy medicine”. I steered clear of the “emotional release quantum shift” (I’m still not sure what that meant) but I did appreciate the abundance of fresh, tropical fruits. And to be fair, that place recommended some tea tree oil which quickly cleared up some very itchy ant bites on my legs. It was such a delight to be overwhelmed for choice by the menus – at a normal restaurant I can quickly pick from the few items that are vegetarian. In Ubud, I have pages of delicious options and choosing just one or two things was tough! The sticky climate didn’t exactly make you want to do anything in a hurry, and we rapidly adjusted to the leisurely pace of the island. In the mornings, The German would retire to the working space for a coffee and computer time while I either went to a Zumba class or worked out on my own on the yoga deck. Our afternoons were spent exploring the area on foot, hanging out at a local cafe, or sometimes I would opt to enjoy one of the many spas. Labour is cheap and plentiful here. While many shops and cafes seemed over-staffed with workers who weren’t especially attentive, the spas were a different story… there were an endless number of them, each better than the next. And since massages were $9-$15/hour, I was tempted to go daily. My massage and body scrub at Putri Day Spa ended in a flower bath – so decadent! I also had an extremely decadent “Twin Massage”, which meant two therapists massaged me simultaneously! There really isn’t anything better than someone massaging your shoulders while someone else rubs your feet – all for $15! The body is carried up the ramp and placed in the tower. The ramp is then removed, and the bull and the tower are carried from the Royal Palace to a temple on the other side of town, accompanied by musicians and the entire population of Ubud. Even today, women who are menstruating are forbidden from taking part in any of the rituals, bathing or otherwise. Thankfully, they relied on the honour system to enforce this, not any kind of inspection. We have enjoyed staying at Roam so much that we have decided to return in mid March, after our adventures in Borneo visiting primate sanctuaries. I didn’t know much about Bali before we decided to come here, but The German was intrigued by a coworking refuge he read about and we had the chance to overlap with some friends from SF. People always speak about Bali as being a relaxing, spiritual place (except for Kuta, which is the party city filled with drunk Australians, apparently). When we were in Melbourne, we overheard an Australian guy telling his friend how he met a healer in Bali who educated him on his past lives. He went on to gush about how he felt so enlightened about his current relations, as his past life was obviously influencing the way he interacted with people. What was his past life? I thought he said “tyrant”, but The German heard “pirate”. Either way, it certainly painted an interesting picture of what kinds of people we might encounter. Getting a flight from Melbourne was easy. There wasn’t a good option for using miles so we went with the cheapest possible ticket. JetStar is about as budget as they come – luggage is charged by the kg and no complimentary anything (if you want water, you can get it from the back yourself). The reviews online are overwhelmingly awful so we braced ourselves for long lines and a horrible 5.5 hour flight. Despite it being low season in Bali, the Dreamliner was nearly full of Australians headed on holiday. Though the seats were quite cramped (easily the narrowest seats I have ever experienced), it was otherwise not as bad as we envisioned. So yet another reinforcement that it’s best to go in with low expectations (and a couple glasses of wine). We made the mistake of not buying SIM cards in the airport. In hindsight, 12GB for $7 was more than reasonable, but our flight landed at 12:45am Melbourne time so we weren’t thinking clearly. Instead, we wound up bartering with some guy in a shop the next day who had to trim the SIMs using what looked like kiddie scissors. A few days later (with help from someone at the hotel) we discovered that mine was expiring in a few days (it was supposed to last for 30) and The German’s barely had any data on it. This is certainly not the most expensive mistake we’ve made, but next time we will be sure to buy them at the airport. I spend quite a bit of time researching where to stay to make sure we get the best value for our money. It’s a complex mix of Trip Advisor, Hotel Tonight, AirBnB and Expedia. The German often teases me about this, but it usually results in us getting an unusually funky pad/saving money. Yet again, I have to sing the praises of Expedia (which I only started using at the beginning of this trip). They usually have the best prices on hotels, and we have used them enough that on rare occasions we get some extra perks. In this case, it was a complimentary upgrade at The Amala Hotel. Plunge pool with jacuzzi jets, outdoor bathtub, shower with steam sauna, sink with many oils and salts and herbs for the bath and shower. Not pictured: 2 sun loungers, a mini fridge with complimentary cookies and cold drinks. The hotel only has 15 rooms (I think?) and since they will deliver breakfast to the room at no extra charge, we rarely saw anyone else. I chose Seminyak as it seemed to be a popular destination and was close to the beach. Bali isn’t known for its beaches, but apparently the waves are good for water sports and Seminyak is a popular surfing spot. The main roads had sidewalks (always a delightful surprise in southeast asia!) so it was pretty easy to walk around. Even though the shops looked very modern, there was some kind of shrine or temple every 3 or 4 buildings so it was an unusual mix of old and new. The main streets had a lot of clothing shops (you can get a lot of clothing at a fraction of what it would cost in the US or Europe since it is made here) and a lot of places selling silver jewelry. Otherwise, it was restaurants, day spas, and tattoo shops. While we did have one decent meal, overall the food wasn’t especially good. Labour is cheap and plentiful, but alcohol is heavily taxed and it seemed like getting nice produce was a challenge. So in other words, we weren’t exactly falling in love with Seminyak. That said, we really enjoyed lazing around our lovely room and having a fairly easy transition into this new country (SIM card experience notwithstanding). Though it is rainy season, the dramatic thunderstorms mostly happened at night so it was nice to watch the lightening from our mosquito-netted nest. Yoga is everywhere, and classes are very cheap. (Our hotel offered them for around $3.50 for 90 minutes.) The first class I took left me sore for days, which The German found so intriguing that he decided to accompany me to the next one. Neither of us are especially bendy, but it did feel good afterwards…. at least I thought so. The German kept claiming “everything hurts” and struggled with basic movements like sitting up. I am not sure why yoga is so popular here, but I suspect it is related to the predominantly Hindu population. The island is full of temples and there are a staggering number of shrines. They believe that pretty much everything has some kind of spirit in it, and there are many rituals designed to keep balance between the spirits, humans, and nature. For example, each shop or house places a daily offering of flowers and rice in a small palm leaf basket on the curb or doorstep. This is to thank the spirits for peace, and also an expression of gratitude that they have enough that they can afford to make this offering. You see them everywhere. And while they start off as colorful adornments, they wind up strewn across the sidewalk or the side of the road. I suspect the wandering dogs also serve as a clean-up crew.